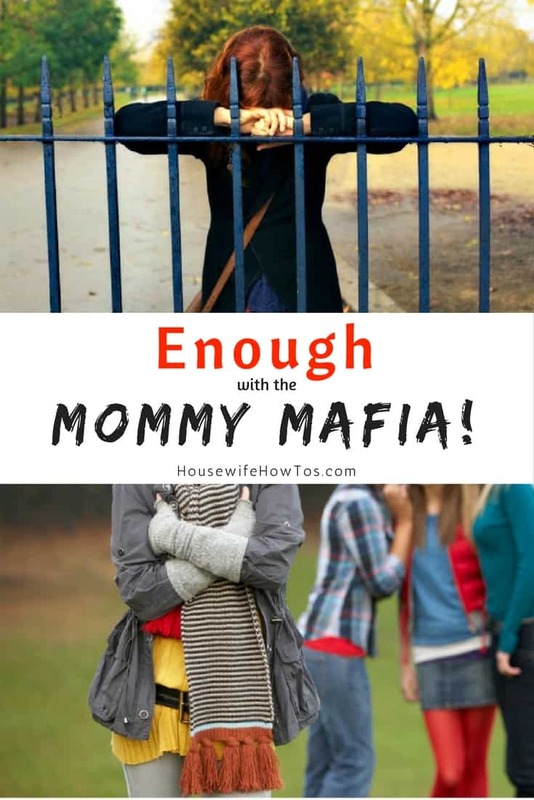 Home » Enough with the Mommy Mafia! What's On The Cats' Menu? New Meow Mix Bistro! Ordinarily, I try to keep my weekly newsletter breezy and light. It goes out on a Monday morning, after all, and Mondays are hard enough already without starting the day reading something long, much less something that might raise our blood pressure. Yesterday, I couldn’t stop myself from sending out a rant of sorts. You see, just a few days ago I’d encountered the Mommy Mafia, and I’d been upset about the entire situation ever since. So upset, in fact, that it was heavy on my heart when I sat down to write this week’s newsletter, and rather than keeping things breezy I went on a bit of a rant. By the end of the day, I had received hundreds of reply emails. With one exception, the responses conveyed thanks and relief from other parents who’d encountered the same situation that I had. Parents who, whether out of politeness or intimidation, hadn’t spoken up in defense of themselves or others. I also received several dozen requests that I make my rant available on the blog so that they could share it with others. A few months ago I promised myself that I would begin making Housewife How-Tos more personal, that I would seek to create a sense of community here and on the Facebook page. 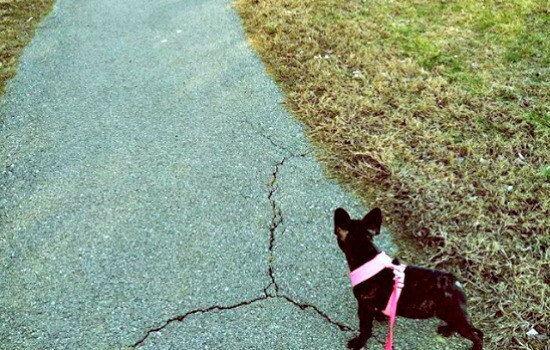 With this blog entry, I’m keeping my promise to myself and hoping you’ll enjoy the more personal connection between us. So, without further ado, here’s what I shared in this week’s newsletter. I hope you’ll join me in this mission. On cool mornings, I like to walk my puppy at a local park where the trails wind through trees that are replacing summer’s green with vibrant shades of red and gold. There’s a playground there. On most mornings I see the same group of young mothers gathered at the base of the play equipment where their toddlers swing, slide, and squeal with joyful abandon. Mercy, my little French Bulldog, is a kid-magnet, so sometimes I stop and talk with the moms while their kids rub her velvet ears or do their best to avoid her avid hand-licking. Recently, I noticed the absence of one of the moms whose abundant red hair was mirrored by that of her daughters. The two so closely resembled each other they could have been a “Before/After” photo taken 20 years apart. The little girl was so good with Mercy that I often had to fish around in my pocket for a treat to get my puppy to tear herself away. After several days without seeing the pair, I finally asked one of the other moms if they’d moved or something. Another one of the moms chimed in, “She said she missed working, and her old job had an opening for someone two days a week. It’s not like she needs the money. Her husband is a lawyer.” This last word was spoken as if it alone explained everything. Over the next few minutes, they made it clear how selfish and self-centered they thought the other mom’s decision was. How they’d offered to watch the little girl, so she wouldn’t have to be “parked” in daycare. How sad it was the little girl was essentially cast aside for her mom’s pursuit of personal fulfillment. Then they said the red-haired mom had invited them and their families to a Labor Day BBQ, but no one had accepted. They’d all claimed previous plans or made other excuses. No one had seen the red-haired mom and her daughter since. I can’t say I blame her. In all of the mornings she’d spent dressing her child in weather-appropriate clothing, packing a nutritious snack and hydrating bottle of water in a bag to bring to the playground, and watching with a safety-conscious eye as her daughter climbed the steps to the slide or swung from the monkey bars, I bet that mom never once imagined that she would be the victim of playground bullies. These days, I do my best to avoid toxic and judgmental people. Life is just too short to let them affect my days. So, I knew that morning would be the last I’d be there with Mercy, that we’d find a different place to take our morning walks. Without exception, they shook their heads. No, their mothers had worked or were involved in other activities. They went to daycare or part-time preschool, or a regular babysitter watched them in their home several days a week. Mercy and I didn’t stick around to listen to their responses. Like I said, life is just too short to be around toxic people, and that includes the Mommy Mafia: the self-appointed “authorities” on how we should raise our kids. Enough with the disapproval and judgments already! 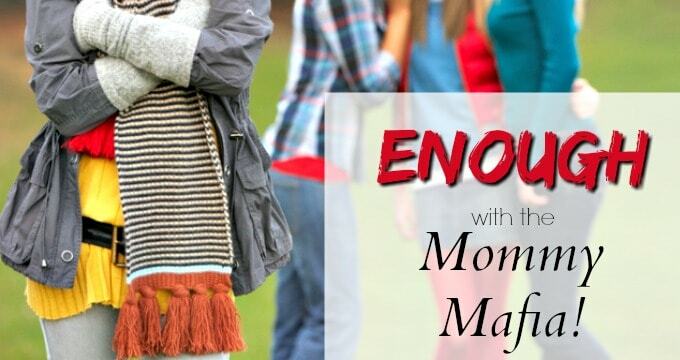 Let’s start catching other moms in moments of awesomeness and praising each other for it. Tell that mom who patiently handles her kid’s meltdown in the store with grace that she’s doing a fantastic job. Compliment the mother of the child who remembers to say “please and thank you” for teaching manners and courtesy. High-five the busy mommy who stops in her tracks to hold the door open for an elderly woman. Look for the good in other moms and it will bring out the best in yourself. We are all doing our best. We are all working our hardest to be good mothers, spouses/partners, and people. We are all stronger when we build each other up, and we are all weakened when we allow someone to tear another down. As I said earlier, of the hundreds of reply emails I received in response to this, only one was negative. That lone email contained a screed about how daycare is a toxic environment for kids, and how we should never approve of a woman putting her child into a toxic environment. The thing is, the woman who sent that email made the same negative assumptions about the red-headed mom that the judgy women in the park had made. For all she, they, or I know that mom’s husband had been laid off, and she had to work to help pay the bills. Or maybe he was sick and couldn’t work full time, so she’d stepped up to help. Maybe the mom had lost her individual identity and had been advised by her therapist to start working part-time to overcome a suicidal depression. Or maybe she’d decided she could be a better mother by working two days each week while her daughter played at a daycare she felt good about. Ultimately, we have no idea what’s going on in other mom’s lives, and we need to stop assuming the worst about them. It is hard to be a parent. We all make sacrifices to do our best at it, often in ways that others will never see or would never understand. We alone know what’s best for our families, and we shouldn’t have to make those choices under the constant threat of disapproval from others who have no idea what we are dealing with. It’s time we start lifting each other up, not tearing each other down. We will all be better people, and better parents, for it. Fantastic post Katie. I couldn’t have said it better myself. I’m sure, in my Mother’s Day, there was no such thing. All the mums stuck together and actually helped each other out. I can remember not having any help whatsoever when my children were first born. I seriously don’t know how I managed, but I did. My Mum lived on the other side of town and didn’t drive. If I wanted her to see her grandchildren, I had to go over there. Not one single neighbour ever came to check on me. I just don’t know what’s happened in the world. Thanks so much for sharing your post at Thriving on Thursdays. I’m featuring it at tomorrow’s party. I’m sorry you were so isolated when your kids were little. Life is much less connected offline than it used to be, I think. And when we do manage to connect with each other offline we’d all do better if we’d help and build each other up. I agree 110%! There is no need to judge people for doing the best they know how in this extremely hard job known as parenting. No one way is the perfect way. Every child, home, situation is different and we need to do what is best for us and our families. I also try to stay away from toxic people. We are all better when we build each other up! Exactly, there’s no perfect way so no one knows best. We need to give each other credit for trying our hardest to do it right, then mind our own business and build each other up! It is sad, isn’t it? It’s hard enough to be a parent. We don’t need to make it harder on each other. Wow. I can’t imagine having that attitude toward another mother. It’s just so sad that people feel such a strong need to tear others down. Thanks for sharing this story. Isn’t it sad? And this attitude makes so many moms second-guess themselves so they don’t become the target of judgmental moms, then they wind up stressed out and frustrated. great post! I love your perspective thanks for sharing it at the Block Party this week. This is brilliantly written! BRAVO! Thank you, Claire. I appreciate the kind words and that you’re sharing my post! Thanks for sharing at this week’s Inspiration Spotlight party. See you again soon. It amazes me that women…can’t support women. 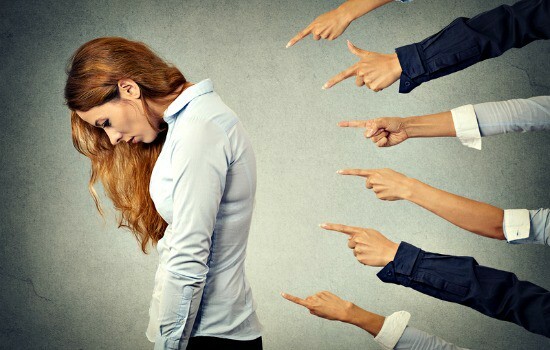 I think some SAHMs have to justify their lives to themselves, so they’re especially bitchy to any woman who makes a different choice.